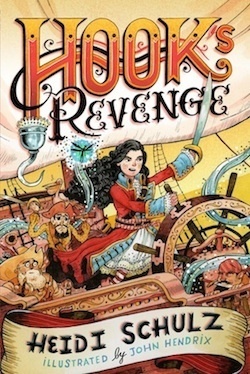 Hook's Revenge by Heidi Schulz is a captivating mixture of fearsome pirates, a courageous and adventurous female lead character, and a sarcastic yet charming narrator. In other words, this book is absolutely fantastic! Inspired by the classic tale of Peter Pan, the book follows 12-year-old Jocelyn, who dreams of becoming every bit the pirate as her infamous father, the legendary Captain Hook. So it's no surprise that Jocelyn springs into action after receiving a letter to avenge her father's death at the jaws of the Neverland crocodile. Hook's Revenge is funny, clever and perfect for kids and adults alike. I was fortunate enough to catch up with Heidi Schulz and get all the details on her fabulous debut novel. What was the inspiration behind your book Hook's Revenge? Peter Pan has always had a special place in my heart, though I didn't take the time to read the original book until I was a young adult. Once I did, however, I was absolutely charmed. A handful of years later, I chose Peter and Wendy as the first longer-than-a-sitting book to read to my daughter. I can still picture her as a pink pajama'd two-year-old lying in her toddler bed and quietly playing with her toys while I read aloud. Though at first I wasn't sure any of my words were sinking in, she soon began acting out scenes she had seemed to ignore when I read them. Peter Pan became both her imaginary friend and alter-ego for the next few years. We spent many hours fully steeped in Neverland, pretending to "fight those nasty pirates" together. One day, when she was about five, I came down with the flu. I made myself a little nest on the couch, put out some Goldfish crackers and juice boxes, and set up a couple DVDs: Hook and the live action 2003 Peter Pan. While she watched, I slept, the sounds of the movies filtering through my virus haze. When the movies ended I woke up with a question in my head: What if Captain Hook had had a daughter? Hook's Revenge grew from that day, though it would be several years before I would get serious about completing it. Tell me a little about yourself and how you got into writing. I have always loved stories. I read all the time as a kid, and when I couldn't read, I'd entertain myself by making up stories. I got in trouble numerous times at sleepovers by keeping everyone else up telling scary stories -- which more often than not, scared me the most. In 2004, I started blogging and was semi-serious about it for some time. There were a couple of long periods -- well over a year each -- where I blogged every single weekday. I wrote about my family, homeschooling, crafts and recipes. Even though none of my posts were fiction or anywhere near novel-length, I learned a lot about the craft and business of writing, for example, how to create a narrative arc, writing humor, descriptive settings, and working on a deadline. When I finally decided to get serious about completing Hook's Revenge I drew heavily on those lessons. So many authors are writing young adult books. What made you decide to write a middle grade book? When I first started writing this book, I didn't even know what middle grade was. I was simply telling a story where the main character happened to be a preteen. I may not have made a conscious choice to write middle grade at that point but I truly love writing in this category and plan to keep at it. Kids in this age range are just starting to see how wide the world can be outside their doors and they are starting to think about their place in it. At the same time, there is still a sense of wonder. An acceptance letter to Hogwarts or passage through the wardrobe to Narnia aren't out of the range of possibility. I love that. I really liked your main character Jocelyn. What went into crafting her character? Thank you! She is such a fun character to write. I'm so glad you like her! On that fluish day I mentioned above, right after I asked myself What if Captain Hook had had a daughter? Jocelyn popped right into my head. I could just see her with her mess of unruly curls and wearing the too-large jacket of her father. She seemed defiant, sassy, headstrong, and with a deep need to prove herself. I couldn't wait to find out her story. She really came alive on the page, and with each revision I saw her a little more clearly. I'm quite proud of her. Any chance Hook's Revenge will be a movie? If so, do you have a dream cast? There's nothing currently in the works but if there were I would give anything to see Peter Dinklage do it as a one-man show. What is next for you in terms of writing? Any new projects on the horizon? I'm currently hard at work at Hook's Revenge: The Pirate Code, out in September 2015. I'm thrilled Disney•Hyperion decided to purchase a sequel from me, even before Hook's Revenge had any sales or reviews to bank on. I'm so grateful for the faith they have shown in this story. I don't want to give away too much, but in The Pirate Code readers will get to see a lot more of the Neverland and meet some fun new characters. Jocelyn, Roger, and the crew of Jocelyn's ship will be hunting for Captain Hook's treasure, while being pursued by an evil pirate with a thirst for gold. And of course, there will be a lot more of that irritable pirate narrator. I'm having such a great time writing it! Also upcoming: Bloomsbury Kids will publish my first picture book, Giraffes Ruin Everything, in Spring 2016. I can't wait to see it start coming together! If you had to describe your book in one word what would it be? Ooh, that's hard. How about hilarious-and-subversive-but-with-heart? Is hyphenating cheating? Perhaps my pirates have rubbed off on me a little. They never do play fair.